The UFC Denver weigh-in results are rolling along. Tomorrow night (Nov. 10), UFC Denver takes place inside the Pepsi Center in Denver, Colorado. This will be the promotion’s 25th Anniversary show. 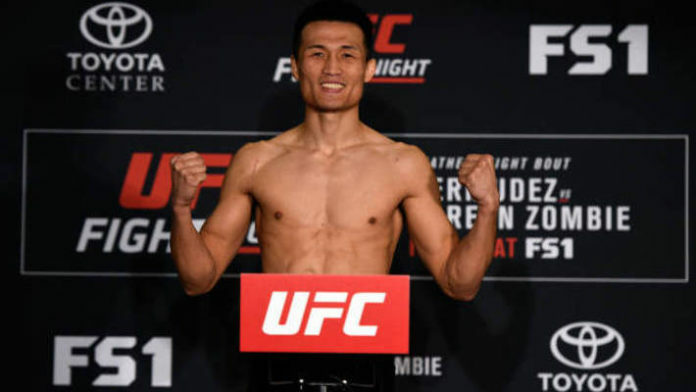 In the main event, the “Korean Zombie” Chan Sung Jung will meet Yair Rodriguez. Jung weighed in at 146 pounds, while Rodriguez clocked in at 145.5 pounds. The co-main event will feature a grudge match between Donald Cerrone and Mike Perry. Cerrone tipped the scales at 170 pounds. Perry was able to hit the 170.5-pound mark. MMA News will provide live coverage of UFC Denver tomorrow night. We’ve got you covered from the prelims all the way to the main event. Stick with us for highlights, results, and post-fight tidbits. There will be no ceremonial weigh-ins tonight, but you can check back here for staredowns, which will take place shortly after the official weigh-ins conclude. The UFC Fight Pass portion of the UFC Denver prelims will begin at 7 p.m. ET. The action transitions to FOX Sports 1 at 8 p.m. ET. The action will remain on FS1 once the main card begins.